ELEMENTS OF METAL: I. Collapsing Obsidian Sun (2009) 7 min. Filmed and edited by Taylor Rankin. Audio recording by Zach Miley. Recorded at San Francisco Conservatory of Music September 1, 2013. Coming from a Metal background I tend to gravitate towards aural effects that evoke the same sensations I feel when listening to it. I knew that the three string players that were going to perform this piece are virtuosos and this is what inspired me to write something that “shreds.” At the same time, I wanted to pay tribute to the three Metal bands that I am closest to: Antagony, All Shall Perish and Hacksaw to the Throat. I found three distinct musical trademarks from each band and used recombinant techniques to form the piece. The title comes from the opening lines to Hacksaw to the Throat’s “Cascading Down.” I listened to the song repeatedly when I composed “Collapsing Obsidian Sun,” and my friend (fellow UCSC graduate student [in Math] who composed it) even showed me how to play it on guitar. Its a musical setting to lyrics about what would happen to the Earth if the Sun became a supernova. 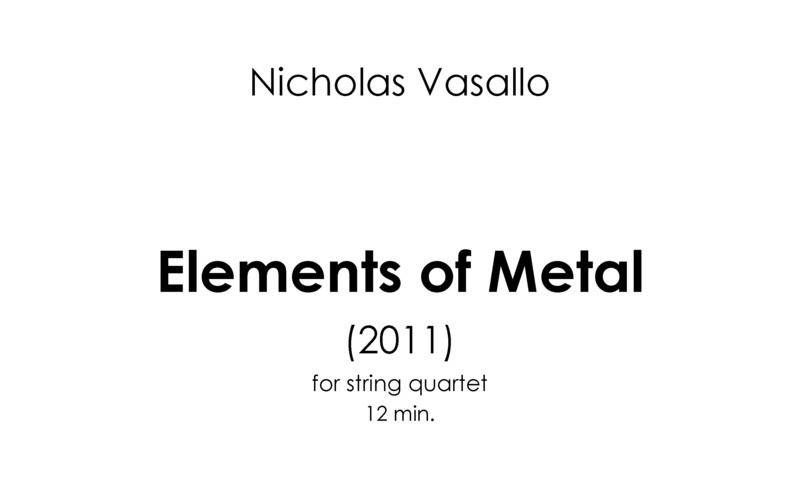 ELEMENTS OF METAL: II. Omnes Perituri (2011) 6 min. I have never written a purely string ensemble or string quartet piece. Though after requests from the resident ensembles at SUNY and UCSC I began to hear the same requests: “Make it fun to play and Metal.” Knowing that I was in Death Metal band since a teenager and all of my music in some sense has strong Metal aesthetics, they weren’t asking me to go out on a limb. My goal with this piece was to satisfy their requests but also create a work that was challenging to listen to (despite it not being technically demanding). “Omnes Perituri” translates to “All Shall Perish” – a prominent band in the extreme metal scene for whom this work was originally written.